AOC Crémant d’Alsace is the jewel in the crown of the sparkling wines produced in Alsace. Fresh and elegant, Crémant d’Alsace is developed by secondary fermentation, and predominately made from Pinot Blanc, but also from Pinot Gris, Pinot Noir, Riesling or Chardonnay. These varietals are in general picked at the very beginning of the harvest, an auspicious moment when the grapes offer the best balance and harmony for vinification. As early as the late 19th century, serveral compagnies in Alsace were producing sparkling wines by the traditional method, not only in the vineyard area but also int he cities of Strasbourg and Mulhouse. This tradition, while less commonplace during the first half of the 20th Century, was continued until the creation of AOC Crémant d’Alsace, by the decree of August 24, 1976. For the wine houses of Alsace, this decree produced the new framework necessary for the production of a high-quality sparkling wine, applying similar, strict demands to those applied in the Champagne region. Today, more than 500 producers are united under the Syndicate of Producers of Crémant d’Alsace. Because of its unique personality and outstanding quality, Crémant d’Alsace is currently the top AOC sparkling wine to be consumed in homes across France. It has also earned considerable international recognition. AOC Crémant d’Alsace represents 22% of the region’s wine production. Andrée Trapet makes a crémant made of Chardonnay, Pinot noir and Auxerrois, from the towns of Riquewihr and Beblenheim. It is vinified in the traditional manner, in accordance with the Méthode Champenoise, with an initial slow pressing. The bubbles in this Crémant d’Alsace are fine: it is an elegant “Brut”. The blend of Chardonnay, Pinot noir and its beautiful maturing mean it can be appreciated right away or for another 3 to 5 years. Varietals: blend of Chardonnay, Pinot noir and Auxerrois. 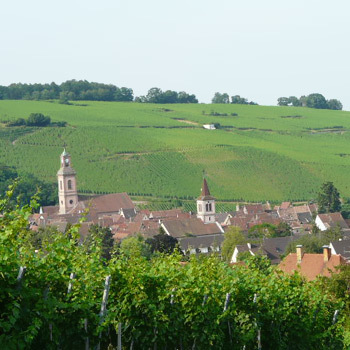 Vineyard locations: The grapes are planted in the towns of Riquewihr and Beblenheim. Vinification and growing: Traditional vinification, Slow pressing, Méthode Champenoise.